A week after the seventh day of Passover, Jews around the world mark the Day of Remembrance, or Yom Hashoah, differently. In Israel a siren is heard at sundown and again at sunset for 2 minutes of silence when everything, including traffic, stops. Families in America may light a a yahrzeit (memorial) candle on this day and recite Kadish (the prayer for the dead that never mentions death) in order to bear witness to the unthinkable. Bob’s Grandparents came to this country before the war. Still, many relatives were lost. The only woman I ever met with a number on her arm, passed away on the second day of Passover this year. She was the Mother of a cousin in NY, and was married to another survivor. They both died with their families around them in great old age. They met as youngsters after the war in a refugee camp in Italy. That love can survive that period of time, the Shoah, is miracle enough. Silence and indifference to suffering, silence and indifference to injustice, fear and hate speech are part of what lead Europe off the brink of sanity in the 1930s. 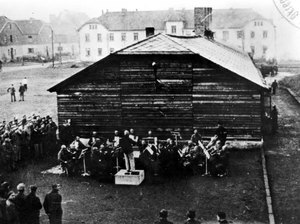 Today, more than 30 death camp violins have been restored and music from the camps has been recreated. Today the Auschwitz violinist can play his instrument again.